Salad... something I refused to eat when I was younger but now can't get enough of. With recipe after recipe crossing my desk, those with store bought dressings are usually passed over in favor of those where I can make my own. Hence, when a representative from the Harvard Common Press emailed asking if I would like to review a copy of Michele Jordan's Vinaigrettes & Other Dressings , the answer was a resounding, "Yes!". Receiving the photo-splashed book a few days later, the continuing title of "60 sensational recipes to liven up greens, grains, slaws, and every kind of salad" had me certain I'd made a good choice. Pouring an iced tea I settled myself in a comfortable chair in the sun and proceeded to read the book cover to cover. Usually I turn down the pages of recipes I want to come back to, but with this book the process was pointless. After turning down every page except the Sunday Morning Miracle - Bloody Mary Vinaigrette (I personally am not a Bloody Mary fan, but that's another story...), I gave up and realized I have some 59 new recipes to try. Michele begins the book with a wonderfully informative section called "A Happy Pantry" filled with tips and ideas about basic ingredients important to have on hand to help you easily put together a quality and flavorful dressing. Moving on she covers tools and their importance, food safety and flavor. Arriving at the recipes, Michele brings everything from the most basic simple vinaigrette to those with more complex flavor nuances and on to classically creamy concoctions everyone is sure to love. Finishing up with ideas for slaws, potato and pasta salads as well as a couple of bread versions, all areas of salad seem to be covered. Each dressing includes a description, and my favorite part, a "Best Uses" section with additional ideas for serving. Many recipes include gorgeous photos (I'm a sucker for a cookbook with beautiful photos), and with further investigation I discovered Michele styled the photos herself. Keeping my post seasonal, the perfectly ripe watermelon on my counter called my name. 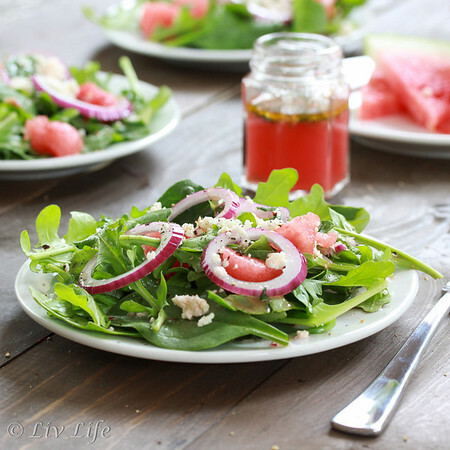 I've used watermelon in arugula salads for years, but as Michele mentioned, many vinaigrettes including boldly flavored vinegars tend to mask the sweet melon flavor. 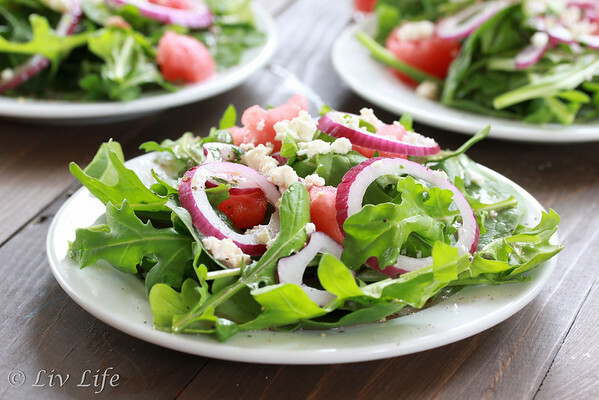 Her version actually uses watermelon juice as a base bringing a sweet, fresh flavor to my beloved arugula. Serving to enhance the sweet watermelon pieces in my salad, the dash of lime and sprinkle of chopped cilantro complemented the flavors beautifully actually leaving my Watermelon Arugula Salad indeed tasting like watermelon (see recipe below). Liv Life: Through the book, are there a few recipes that have become regulars in your kitchen? Favorites of you or your family that return time and again or are most requested? Michele Jordan: My daughter Nicolle loves the Honey-Pepper Vinaigrette and the Yogurt-Tahni Dressing. My grandson Lucas is very fond of the blue cheese dressing. His mama, my daughter Gina, has a passion for the Caesar dressing. I always have either salsa verde, chermoula or chimichurri and usually a raita, too, on hand. And we all crave the Louis dressing when Dungeness crab is in season. My daily default dressing is Lemon Citronette. LL: I believe I read that you did your own food styling for the photos in Vinaigrettes and Other Dressings, any tips for readers on making their everyday presentation more attractive? MJ: Don't over arrange; there is a beauty to controlled chaos--not sloppiness, just the natural beauty of random order. Embrace asymmetry. When you learn to embrace and understand this, everything gets easier and more beautiful. As far as everyday goes, use the good stuff! Life is short. Use pretty dishes, nice napkins, etc. Spend an extra 2 to 3 minutes on how things look and you'll be amazed by the different. Forget the stacks and other over-arranging done by professional chefs. LL: I see you are a Bay Area native (I grew up in Marin County), where did you grow up and what drew you to Sonoma? MJ: I've been connected to Sonoma County my entire life--I nearly drowned in the Russian River when I was not quite 3. I moved here as soon as I could to attend Sonoma State University and I've never left. I grew up in Vallejo, a world unto itself, but always felt an affinity to the open spaces of Sonoma, the redwoods, the fog, the rolling hills, the coast, the fertile land. It is my home. LL: Has food always been a part of your life? MJ: Yes. I had an eager and curious palate as a child and found ways to get the things I wanted to eat fairly early on. I began cooking from recipes when I was 8. I began hosting dinner parties when I as 9. My mother was a terrible cook, though she loved making candies and baking cakes and was good at that. Alas, for her, I didn't have much of a sweet tooth. LL: I've read you enjoy all types of writing, do you have a favorite? MJ: Storytelling--i.e., nonfiction narrative--is my passion. You see this style in my book Salt & Pepper, especially, but also in all my other books. I slip it in wherever I can and am at work on a non-food-related literary memoir. MJ: When I was in high school, I could not imagine any future at all. I married at 16 (a long strange story), didn't miss a day of school, started college when my younger daughter was 3 weeks old, left my marriage at 21, with two baby girls. Somehow I always knew I was a writer, though for a long time I didn't know how I would actually make this happen. But it was in my bones from a very early age. Junior high and high school were miserable and complicated times for me. I am probably still recovering ;-) Not probably, actually. LL: Your bio describes a passion for dance, my daughter share's your passion. How did you come to know and love the hula? MJ: This story will be told in the memoir but it has to do with a boy I fell in love with when I was 9. He was Hawaiian and he and his family had a huge impact on me. They still do. I started studying hula (in the past, I'd studied ballet and I've always danced) about 11 years ago, as a way to honor him and grapple with my grief over his death. I loved hula from the beginning and have recently entered into a formal program of study. But he is the genesis and the foundation. LL: And speaking of choreography... tell me about choreographing the world's largers BLT?? MJ: In a way, it was all about choreography. I divided the sandwich into sections--8 feet per section--and had 4 people assigned to each section. Everything was prepared in advance, of course, and the most fun part was the Parade of Ingredients, lead by a marching band, me, the Mayo Queen, 3 toddler salt flakes, a head of lettuce, 2 tomatoes. Then came the bacon (each bacon team member, carrying their bacon), the lettuce and the tomatoes. Bread, mayonnaise, salt and pepper were already in place at the long table. When the Mayo Queen dropped her golden spatula and said "Let the slathering begin," the teams followed the instructions and made their section. It took maybe 10 to 12 minutes to construct the entire sandwich, which was then sliced and sold. You can check out worldsbiggestblt.com. Many thanks to Michele and the Harvard Press for including me in the launch of this fabulous book. 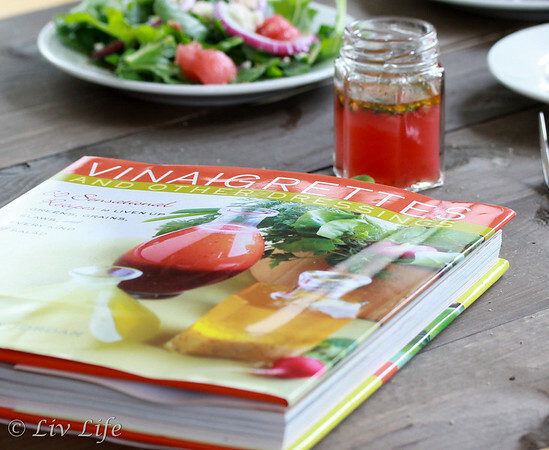 I'm honored to wholeheartedly recommend Vinaigrettes & Other Dressings: 60 Sensational recipes to Liven Up Greens, Grains, Slaws, and Every Kind of Salad to anyone looking to liven up a salad. The book provides endless ideas for not only salads, but marinades and sauces for everything from fish to fruit to even desserts. Pick up a copy and enjoy an afternoon reading in the sun followed by salads with endless flavor. Shot with our new Lensbaby Composer Pro... loving this new lens! From Michele Jordan, "This dressing illustrates perfectly my approach to both flavors and textures. I prefer pure, pristine flavors and lean, bright textures that allow such flavors to sparkle on the palate. Most often, I select a single major ingredient and add other ingredients to support it, not eclipse it. 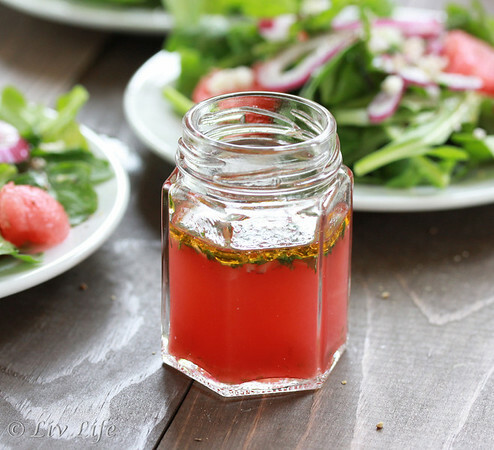 Watermelon vinaigrette has become quite popular in the past decade or so; there are even commercial versions. Yet I've never had one that actually tasted like watermelon. boldly flavored ingredients like red wine vinegar, balsamic vinegar or honey eclipse the delicate taste of watermelon, as do such additions of cream, sour cream and créme fraîche. And when it comes to technique, I never, ever put watermelon in a blender or food processor, as it becomes foamy, a quality I find unpleasant and impossible to correct. If you love good watermelon in season-for me, that means late summer and fall-you should love this vinaigrette." And love it we did. Thank you Michele! Put the juice in a small bowl or jar, add the onion, chile, lime juice, simple syrup and salt and stir. Taste, and correct for salt and acid. Stir in the olive oil, add the cilantro, and season with several turns of black pepper. Chill for 30 minutes before serving. This vinaigrette is best the day it is made. Notes: For 1 cup watermelon juice, you'll need about 2 1/2 cups diced watermelon. Simply cut open a melon, scoop out the flesh, and cut it into small dice. Put the diced watermelon into a strainer set over a deep bowl and stir the watermelon now and again as it drains, 20 to 30 minutes. Occasionally crush the watermelon gently with the side of as spoon, but do not press it through the strainer. Strain the juice before using. Simple syrup, sold in many stores as bar syrup, is easy to prepare at home. to make it, combine equal quantities of granulated sugar and water in a saucepan set over high heat. Do not stir. Simmer until the sugar is dissolved and the liquid is entirely clear, not cloudy, 5 to 7 minutes. Remove from the heat, let cool, pour into a bottle or jar, and refrigerate. Stored properly, simply syrup keeps almost indefinitely. Best Uses for Watermelon Vinaigrette: Beet carpaccio; halibut carpaccio with microgreens; halibut gravlax, arugula and feta salad, salad of julienned jicama, carrots, and radishes, salad of fried haloumi cheese with arugula and toasted pine nuts; fruit salad with whipped ricotta. Liv Life Note: Our salad consisted of baby arugula, red onion, watermelon pieces and crumbled feta topped with Michele's Watermelon Vinaigrette. I topped mine with additional black pepper. What a delightful post and an amazing salad Kim. Love your photos, you've got me wanting to run out to the store and purchase a watermelon! What an awesome cookbook. And salad. It looks so much like summer. We have the temperatures but not the sun so i wouldn't mind a plate or two of this to make things a little brighter over here! Ok, I do NOT need another cookbook. Absolutely do NOT. But, I may have to sneak this in some way. Great review, interview and dressing recipe! 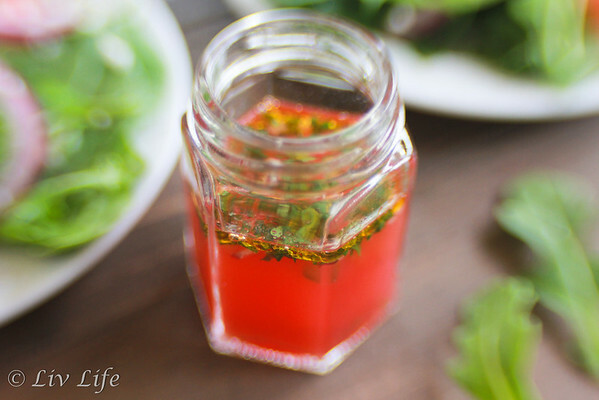 Watermelon vinaigrette, how gorgeous! This is a must-make.